You don't often see exotic English supercars parked in front of your local supermarket, but this Lotus Exige S was spotted in front of a Wegmans in Erie a few days ago. The perfect choice for making 148 mph runs to pick up a few rolls of toilet paper - which you may very well need after a spirited drive in this machine. The Exige S features a supercharged 1.8 litre Toyota sourced four cylinder producing 218hp mated to a 6 speed engine and is good for a 0-60 time of just a tad over 4 seconds. Volkswagen began producing the Mk 1 Golf/Rabbit based pickup truck in 1979 at their new North American plant in Westmoreland, Pennsylvania. It was the VW attempt to cash in on the new compact truck segment that was gaining significant popularity at the time. Natrually, the prime location of this market was in the United States. Cleverly, VW decided to base their new compact truck on the Rabbit which was already being built in the States, thus saving on development, tooling, and shipping. This particular example found its way to my place of employment at Wolfgang's Foreign Car Service in Erie, PA - about 200 miles from it's original assembly point. The body, while recently painted, is showing some signs of corrosion, but overall, the truck is in remarkable condition considering the less than stellar rust-proofing and 25 years of PA weather. The interior is also in fair shape, though the vinyl on the dash is getting a bit lumpy and puffy with age. Poor interior quality was a frequent complaint of the Pennsylvania-built Rabbit cars and trucks. Like many of the Rabbit trucks, this example is a 1.5 litre diesel with roughly 50hp. Needless to say, it's barely fast enough to get out of it's own way. Great Automotive Failures: the Mercedes-Benz w168 A-Class. The Mercedes-Benz w168 A-Class created a big buzz in the press months before its launch in 1997. Understandable, it was the first front-wheel drive Mercedes-Benz and it was that firm’s first venture into the relatively new compact minivan market, not to mention one of the first luxury offerings in that market. It caused such a stir that diecast models of it were already available around the time of its launch; I recall red getting a 1:18 Maisto A-Class for Christmas that year. It wasn’t exactly pretty but compared to the other cars born that same year (Plymouth Prowler, Isuzu VehiCROSS) it didn’t look too bad. Plus, the boxy design meant the A-Class could boast about its exceptional interior room for a car that size. To add to that room, all seats except for the driver’s were removable making for a very versatile car. Mercedes-Benz developed a plethora of safety features including the use of numerous airbags and a system that pushed the drivetrain under the passenger compartment in the event of a front crash. 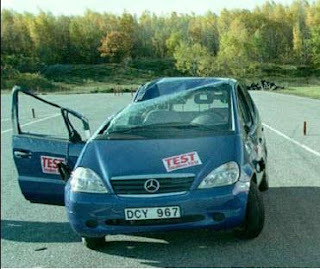 The excitement this car generated faded when it was released to the press and Swedish magazine Teknikens Värld took the car through their moose test, a test which consists of making a sudden maneuver at high speed to avoid an object in the road. The A-Class rolled, failing the test miserably. The problem wasn't confined to Sweden for very long and other European magazines put the car through similar tests. When these journalists also rolled the A-Class while trying to avoid imaginary moose, the car became the Corvair of our generation; rarely in history has a car suffered from such a notoriously bad reputation after its launch. Even the youngest ones amongst us remember borrowing Auto Plus from our uncle and glancing at the cover to find a brand new Mercedes-Benz A-Class going around traffic cones on one wheel. Stuttgart’s first reaction was to deny the problem existed, a strategy that had proven remarkably effective in the early 1990s regarding the 350SD’s rod-bending character. When the problems became widely reported in international press, Mercedes realized they were dealing with an issue that they could not afford to ignore. They recalled all the cars that had been sold already (2,600, according to sources) and stopped production until the problem was fixed. While early speculations centered on the car being fitted with the wrong kind of tires, the problem was solved by retrofitting ESP in recalled cars and adding it as standard equipment across the A-Class range. The rear suspension on all models was stiffened as well, making for a bouncy but safer ride. Lucky for them, these modifications solved the problem and the same readers who saw the A-Class going around traffic cones on one wheel now saw the recalled A-Class going around those same cones on all wheels. These were tested all around Europe and most every magazine found them safe. Today, the early problems the w168 encountered have mostly been forgotten: the car managed to have a successful career and, along with the Renault Scenic, helped launch the craze revolving around small minivans: the controversial Fiat Multipla was launched in 1998, the Citroen Xsara Picasso in 1999 (still in production, I might add), the Ford Focus C-Max in 2003 and so on. This is a market segment where the Mercedes-Benz star doesn’t matter as much as interior space and amenities and the A-Class shines in both of those respects. So successful was the recalled A-Class that it managed to spawn a successor in 2004, the w169 A-Class, available as a three or four door and capable of avoiding a moose while staying on four wheels from the get go. Very popular cars since according to British law, a vehicle with three wheels is classified a motorcycle provided its engine doesn't exceed a certain size (determined by cubic centimeters). That meant these three wheeled Reliants were cheap to register. Safety concerns killed them. Obviously not British but interesting nonetheless. Rarely seen here in France, they're around in the UK because Brits share a certain affinity for station wagons. Contrary to what its looks may suggest, the Mini Moke is actually a factory-produced car, not a kit car. Introduced in the 1960s, it's based on the original Mini and was originally developped to pitch to the British Army who showed very little interest in it. It instead appealed to folks who lived near the beach and needed a summer car to get around. It was to the Mini what the Citroen Mehari was to the 2CV. This particular one was appropriately enough spotted in Carry, France. I found this car while hiking in the hills behind Marseille. It was burned and pushed down a cliff many, many years ago. Who can guess what kind of car it is? - four cylinders, single carburetor. - rear wheel drive, manual transmission. - not an OHC engine. - rear taillights appear to be upright. 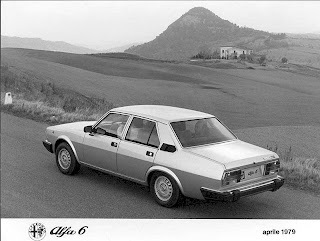 Great Automotive Failures: Alfa 6. Let me start this off by saying that I absolutely adore Alfas and that the Alfa 6 was an amazing car. The equipment level offered was phenomenal, driving it was splendid and the built quality was great. So what went wrong? In 1960s Alfa was looking to replace its flagship 2600 series and borrowed heavily from the upcoming Alfetta's part bin to design the replacement. 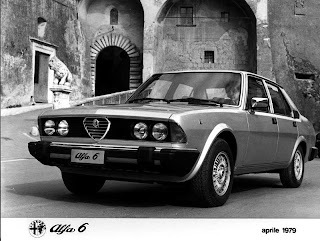 The Alfa 6, known internally as project 119, was the replacement and was originally designed to be launched in 1973. However, strikes within the company delayed production of all Alfas. Furthermore, the oil crisis of that year put a big dent in the demand of large, gas guzzling cars (look at what happened to the mythical Citroen SM) and introducing a new big car at that time made no sense. The launch was postponed until 1979, just in time for the second oil crisis. That created two big problems: first off, launching a big car in any oil crisis was bad news. Second off, precious little had changed since 1973 design and by the time it hit showroom floors the new car looked very dated. Available with either a 5-speed manual or a 3-speed ZF automatic, the 2.5 V6 (with six carburetors!) that gave the car its name often cost a lot of money to register in countries like France and Italy where strict tax systems on large-displacement engines were in place. To salt the wound, its often-fuel-injected German rivals benefitted from better gas mileage. 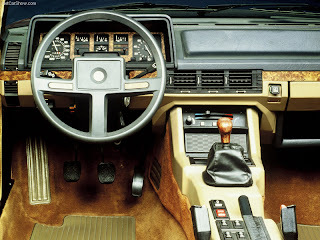 The interior was more luxurious than any Alfa before it. This was to represent Alfa Romeo on the high-end market and the factory paid special attention to the materials used. This resulted in an interior that benefitted from a quality level that was maybe a tad subpar compared to its German rivals but that was way above anything that had previously come out of Alfa Romeo's gates. To address the aging looks the 6 was facelifted in 1983 by Bertone - the most notable exterior change was swapping out the four square lights for two more modern-looking units. The interior was barely touched. New engines were added to the lineup including two new V6s; one was a smaller 2.0, designed with fuel economy and federal taxes in mind. This engine was mostly for the Italian market (where cars with a displacement of over 2.0 were heavily taxed) and was not available in all countries. The other was the same injected 2.5 found in the GTV6 and later the 75. A new 5-cylinder diesel engine was also added - a 2.5 turbodiesel that only produced 105hp, a small amount of power for a car that heavy. The engine was praised at the time as being one of the quietest diesels on the market. 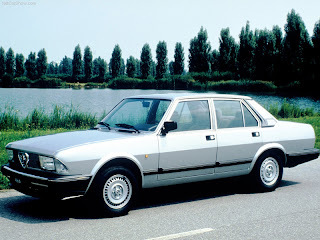 The two new V6s were eventually dropped from the lineup and the Alfa 6 soldiered on largely unnoticed with either the carbureted V6 or the 5-cylinder diesel until its demise in 1987. This brilliant sedan suffered from a dicey introduction and despite its numerous strengths was often overshadowed by its German rivals. While the Alfa 164 (and the 166 after it) filled the hole the 6 left in Alfa's lineup, the Alfa 6 has yet to be truly replaced; there hasn't been a true, top of the line luxury Alfa since. "Concours d'Elegance" is admittedly a bit of an optimistic term on the organizers' part but the ACAPL hosted a car show in downtown Marignane today. The turnout was quite nice despite the iffy weather. Here are some of the more notable cars. If you're reading this in the United States, odds are you have never heard of a Mercedes CLC. Yet look at the photo below and you'll think "wow, this looks oddly familiar." It's actually the old generation C-Class coupe. It was discontinued in the U.S. but kept around and vaguely redesigned in Europe. This particular one is equipped a 2.2 CDI engine. Here are two quick pics I snapped at the local dealer of the new Golf and the new Scirocco. I will take better shots later. The Toyota iQ is also out but I will spare the RWP readership of the pain that seeing it inflicts on the human eye.